Thursday Evening, April 11, beginning at 7:00 PM. During the season of Lent we are challenged in a special way to acknowledge our sins and shortcomings and seek God’s mercy. 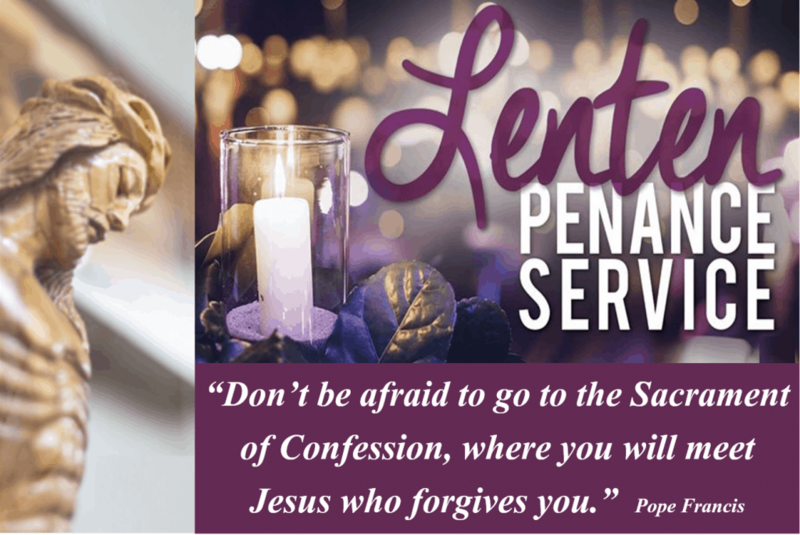 Our Penance Service will provide us with a great opportunity to avail ourselves of the Sacrament of Reconciliation. We can examine our conscience and acknowledge the ways in which we may have compromised our spiritual integrity. The Sacrament is here to heal, not to condemn. It is here to get us closer to the Lord who loves us. Pope Francis stated, “In confession, Jesus welcomes us with all our sinfulness, to give us a new heart, capable of loving as he loves.” He also reminded us that, “Confession is the Sacrament of the tenderness of God, his way of embracing us.” He urged those who have been away from the Sacrament to not be afraid to reach out to the Lord who will receive you with open arms. At the Penance Service, we will have priests from various backgrounds, priests of various ages, priests with various perspectives but having some common purposes: to serve as instruments of the Lord’s pardon, mercy, and forgiveness, and to help us experience spiritual joy in our hearts. Through the Sacrament of Reconciliation, we can get back on the right spiritual course as we cleanse our souls and prepare for the commemoration of the passion, death, and resurrection of Jesus.